OpenSSH uses public-private key pairs to authenticate users. A user attempts to access some network resource and presents its key pair. The first time the user authenticates, the administrator on the target machine has to approve the request manually. The machine then stores the user's public key in an authorized_keys file. Any time that the user attempts to access the resource again, the machine simply checks its authorized_keys file and then grants access automatically to approved users. Administrators have to approve user keys to add them to the configuration, but it is difficult to verify either the user or key issuer properly, which can create security problems. On Red Hat Enterprise Linux, the System Security Services Daemon (SSSD) can be configured to cache and retrieve user SSH keys so that applications and services only have to look in one location for user keys. Because SSSD can use Identity Management as one of its identity information providers, Identity Management provides a universal and centralized repository of keys. Administrators do not need to worry about distributing, updating, or verifying user SSH keys. All three parts from the key file can be uploaded to and viewed for the user entry, or only the key itself can be uploaded. Copy the public key from the key file. The full key entry has the form type key== comment. Only the key== is required, but the entire entry can be stored. In the Account Settings area of the Settings tab, click the SSH public keys: Add link. Click the Add link by the SSH public keys field. Paste in the public key for the user, and click the Set button. 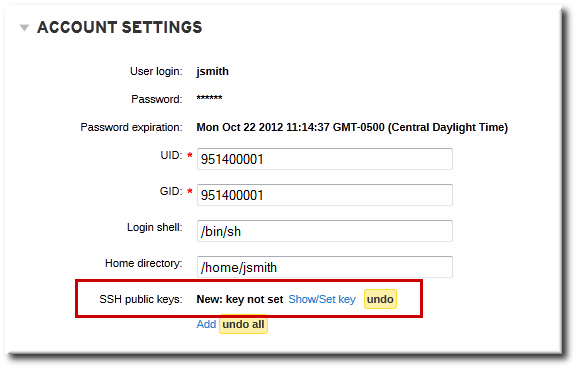 The SSH public keys field now shows New: key set. Clicking the Show/Set key link opens the submitted key. When all the keys have been submitted, click the Update link at the top of the user's page to save the changes. After uploading the user keys, configure SSSD to use Identity Management as one of its identity domains and set up OpenSSH to use SSSD for managing user keys. This is covered in the Deployment Guide. 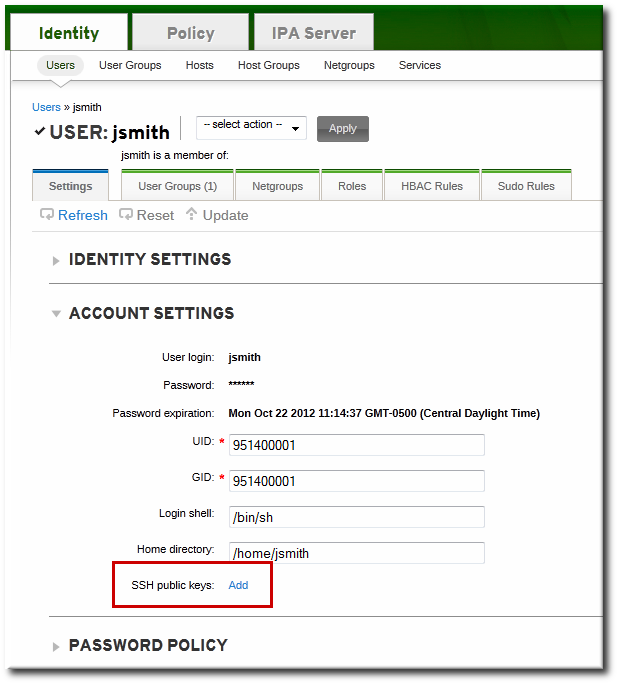 [jsmith@server ~]$ ipa user-mod jsmith --sshpubkey="ssh-rsa 12345abcde= ipaclient.example.com"
With a real key, the key is longer and usually ends with an equals sign (=). After uploading the user keys, configure SSSD to use Identity Management as one of its identity domains and set up OpenSSH to use SSSD for managing user keys. This is covered in the Red Hat Enterprise Linux Deployment Guide. Open the Account Settings area of the Settings tab. Click the Delete link by the fingerprint of the key to remove. Click the Update link at the top of the user's page to save the changes.